The Anderson Kantleak water distribution panel on our new 2018 DBRS3 is leaking like a sieve. This is nuts. A couple days shakedown after purchase plus 2 weekend trips. Now on the end of the first real road trip, the water panel is leaking bad and water is running out from the underside of the unit. The leak seems to be coming from the line supplying the water heater. I've tried to tighten the fitting, no joy. The insulation is soaked and water constantly drips from the underbelly, connected to city supply or onboard fresh tank. Water leaks even when not connected to city or the pump is off and pressure has been released. With assistance from another RVr I've been able to slow, but not stop the leak. This unit is 4 months old. WTF! How many of you have had similar issues and response re: warranty solution with your dealer or DRV? I would guess that about 30% of them leak. Most do not leak like yours. Mine had a very slow leak. I never saw any water but the wood under it was wet. Have you called your dealer? My "Will-leak" valve is now filing my fresh water tank at the rate of approximately 8 gallons a day. And I don't know who makes the water inlet check valve, but that leaks as well. I can't disconnect the fresh water hose without getting sprayed from the fitting until all the pressure is off. 2019 DBRS3 now at 2 months old. 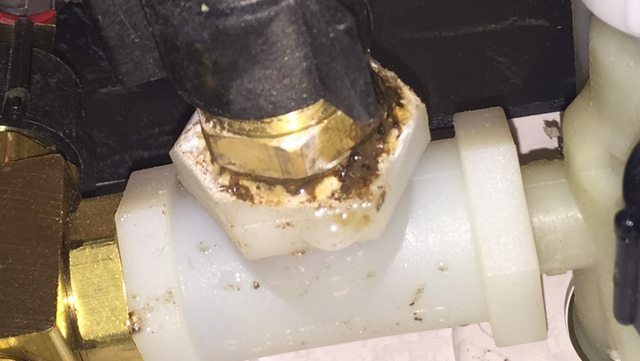 Maybe DRV is still not using the "new and improved" version of the Kant Leak valve that they told me they had come out with back in Feb.
From your description, it sounds like the Valve is not leaking but the hose connection to the valve. The connectors have an O ring that seals the connection. If the O ring is not seated properly or is damaged, it will leak. Have you tried disconnecting the other end first? I had a few leaking connections on the Kantleak water distribution panel as well. Plus the fresh tank filled when connected to park water supply. Chased the problems for some time. Finally after replacing the entire Kantleak valve, which did not solve the problems, I removed the panel again and put Teflon tape on all the connections. This stopped all the fitting leaks. I noticed that without the Teflon tape that when you tighten the fittings by hand and tighten too much, the fitting jumps threads and you lose the tight fit which causes the fitting to leak. With the Teflon tape the fittings can be hand tighten enough so they don't leak. As far as filling the fresh water tank, again tried a number of fixes to no avail. Finally put a shut off valve on the water tank fill line. Now the tank does not fill when connected to park water supply. When on park water, I shut the valve. When on tank water and pump, I open the valve. So far no more leaks and the tank does not fill when connected to park water supply. Funny you should mention your fresh tank being filled.... Mine went from 50%-63% overnight. I mentioned above that a fellow RVr helped me to slow the leak as his new Landmark had a similar problem and he knew where to look for the problem. This is a guy who had just pulled into the site next to us, saw we had an issue and offered to help. He even took the valve apart to check the o'rings and taped the threads to the leaking fitting, (didn't stop the leak). All this before he even set up his own trailer! Now get this. As I said he had the same problem and had to replace his panel. His thought, if it happened once it will happen again. He had a spare panel and gave it to me to replace ours should I not be able to fix the leaking fitting. Brand new,, never used. Imagine that. I called him a Guardian Angel and promised to pay it forward someday. Before you install that valve that he gave you, I would pull the joints and Teflon tape of plumbers dope so it will not leak again. It is great to come across people like him. To me it is all about helping out your fellow man. You get what you put in. I had trouble with my kantleak when I first got my coach - The selling dealer repaired it like they fixed most of my initial bugs - NOT. I worked directly with Andersen Brass and with their coaching and quickly sending parts I repaired it myself. It was good for a few months then it failed again. Again I went to Andersen and they sent a complete new unit which I installed and it has been trouble free for almost 3 years. I'm still a believer in the old adage "if you want it done right, do it yourself". BTW, there was no charge by Andersen for the tech advice or any of the parts. The problem is the pressure in the trailer. UntilI bleed off any water inside the check valves spits out water. This mean you cannot leave the pump on without a screw in cap on the water inlet. Awesome! Always great to hear about others stepping up and lending a helping hand. I sent them an email with a video of the leaks and never heard back. What's the contact person and phone number for Anderson Brass? This sounds like a systemic problem with the part failing rather frequently. I finally figured out where the spot of water was coming from right behind my drivers side front jack. I thought I had the famous "KantLeak" leak! It was just a loose fitting, I tightened it and all is well now. Your pic and description doesn't show the leak. 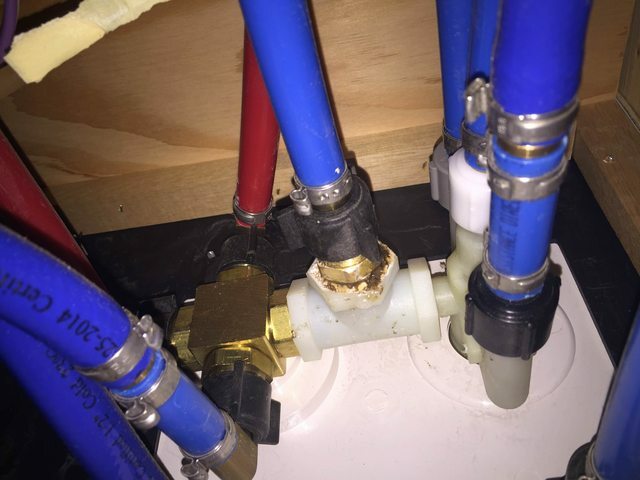 Which of the several fittings in your pic was the leak? It was just a loose fitting, I tightened it and all is well now. I had my second leak on my Second "KantLeak" at the same. The second leak started about 8 months and 4,000 miles after the First "KantLeak KantFix" valve assembly was replaced. The first leak occurred on the right of the plastic TEE to the Hot Water Heater By-pass valve. Now I have a piece of cardboard laying below the valve assembly to be checked often for leaks (wet cardboard).